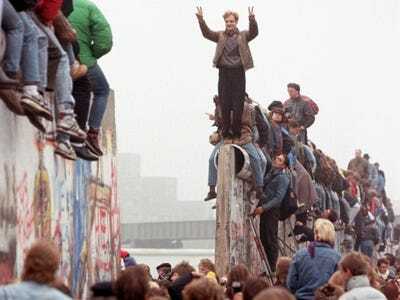 Sunday was the 25th anniversary of the fall of the Berlin Wall, the most symbolic event marking the collapse of the Soviet Union. In the quarter of a century since the wall was knocked down, the political and economic systems in eastern Europe have been turned on their heads: Gone are the communist institutions, replaced with governments that are even more capitalistic than those on the western side of the Iron Curtain. 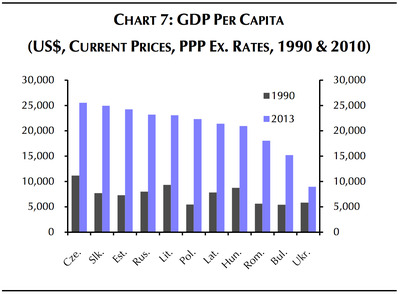 Researchers at Capital Economics have published a fantastic series of charts on the transformation of post-Soviet eastern Europe. We’ve republished a selection of graphs from the report, which takes a look at 11 countries: Bulgaria, the Czech Republic, Estonia, Hungary, Latvia, Lithuania, Poland, Romania, Russia, Slovakia, and Ukraine. There's a huge variation in how countries have grown. 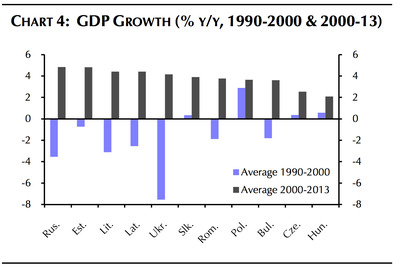 Poland's economy has more than doubled in size, while Ukraine's is actually smaller. 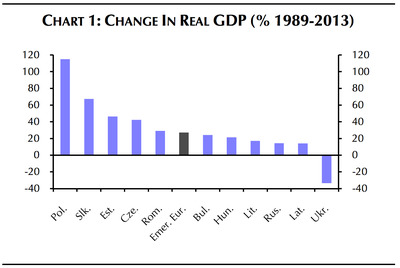 The first decade after the fall of the wall saw extended recessions for eastern European economies, but many saw rapid growth in the early 21st century. 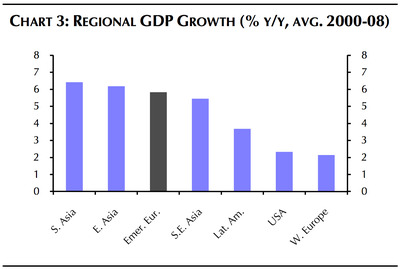 'There has been a vast divergence in performance among countries. Poland stands head and shoulders above the rest of the region in terms of economic performance,' Neil Shearing and William Jackson of Capital Economics noted. 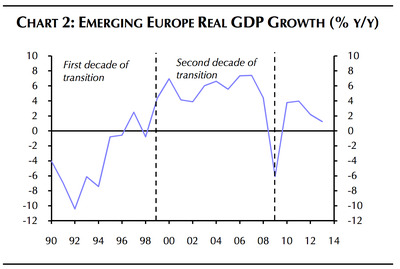 Emerging Europe grew twice as fast as western Europe between 2000 and 2008, expanding nearly as rapidly as east Asia. 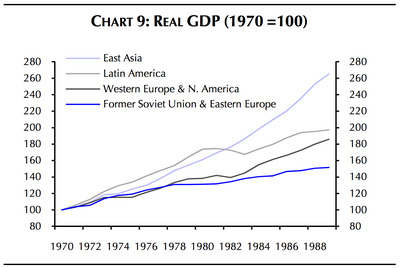 In comparison, the Soviet Union massively underperformed in comparison to western Europe. 'GDP per capita (measured at market exchange rates) has risen from just $3,000 to over $10,000 -- representing a considerable increase in purchasing power,' Shearing and Jackson write. The previously tiny private sector in Soviet countries has come to dominate, taking up a bigger proportion of GDP than in most western nations. 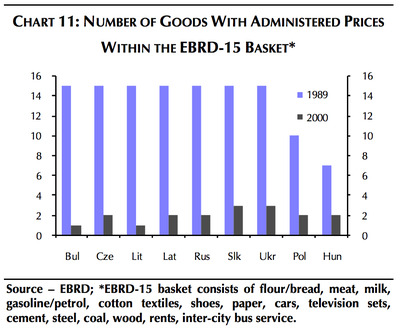 Communist economies controlled prices tightly, while the post-Soviet regimes have relied almost totally on market prices. 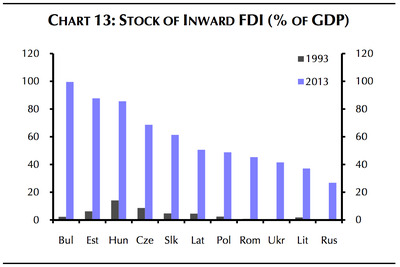 Foreign investment, which was almost unknown under the Soviet system, has exploded. 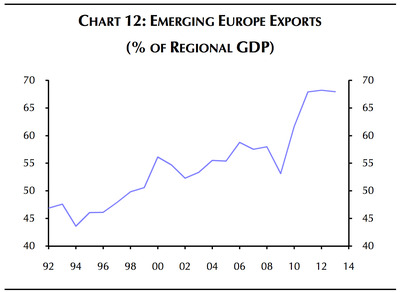 Exports from post-soviet Europe have grown considerably, even since the financial crisis.